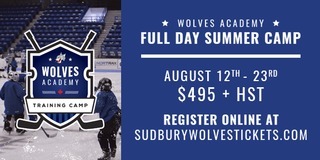 (Greater Sudbury, ON) With the Ontario Hockey League trade deadline past, the Sudbury Wolves’ new era took a fresh approach to building the Wolves development program into a perennial competitor. The 46th edition of the Wolves has faced much adversity in the early going and through the first half of the season while also implementing many new and positive changes on the ice and within the organization including the in-game experience. The new year kept pace with that trend through the trade deadline leaving a Wolves Hockey team that is younger, faster, and bigger while maintaining the competitive and entertaining spark they bring to every game. The Wolves took little time identifying Kyle Rhodes as the next captain in the wake of Michael Pezzetta’s departure. Kyle arrived as an over-age defenseman and has demonstrated natural and consistent leadership all season. 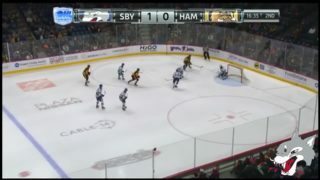 In addition to promoting Kyle, the Leadership group wearing As includes Macauley Carson and Shane Bulitka permanently as well as David Levin on the Road and Drake Pilon at home. With the Wolves leadership re-established, the team can continue to focus on their energy on establishing good chemistry and a constructive disciplined style of hockey that fans will love. 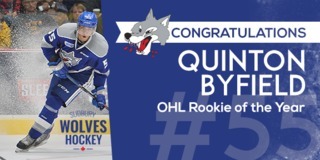 This week the Wolves went out and acquired 2 highly skilled and talented younger players that will have an impact this season and for the foreseeable future. 2016 first round defenseman Peter Stratis from the Ottawa 67s and 18-year-old centre Alexey Lipanov from the Barrie Colts who was drafted in the 3rd round by the Tampa Bay Lightning in the 2017 NHL Entry Draft are going to complement the current depth chart. In addition to the young experienced players, the Wolves acquired several key draft picks including three Round 2, two Round 3, and singles in rounds 4, 5 and 8 complementing the future draft board for the club. In addition, the rights to local product Ethan Lavallee, the big 17 year old defenseman who is currently playing for their affiliate in Rayside of the NOJHL. 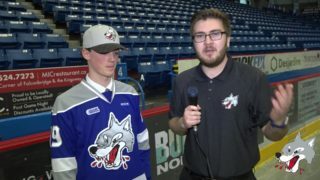 In exchange for the incoming players and future picks, the wolves gave up outgoing leadership in players including overage goaltender, Mario Culina, on Monday, to the Kitchener Rangers, followed Tuesday by the captain, forward Michael Pezzetta to the Sarnia Sting and 4th year defenseman Reagan O’Grady to the Mississauga Steelheads. 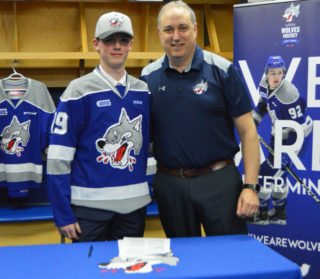 On Wednesday morning the Wolves sent 19-year-old forward Dmitry Sokolov to the Barrie Colts. 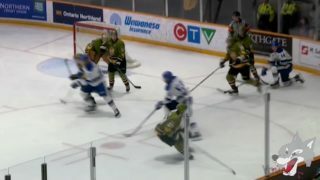 In addition to the players that left this week, Sudbury traded away a surplus of 5 picks. All draft choices except the conditional 3rd round pick to Barrie were received through previous exchanges. The team did not have a lot of time to gather together and prepare as they hit the ice in Barrie last night losing a lopsided affair. It was clear the emotions of the week affected the team and the adrenaline ran out of them. Tonight they look to bounce back and put last night behind them and continue to improve.